COMPARTMENTS: The HT-series of heavy-duty horizontal barrel finishers are available in a variety of barrel sizes and compartments from 20",30" and 36" barrel diameterstandardwith one to a total of four compartments per machine The HT series offer the most versatile capacities to handle a broad finishing range from hardened steel to soft non-ferrous metals and from rough deburring to high luster burnishing. All RAMPART HT series barrel finishing machines have "unit design" construction, which will allow for the versatilityof single or multiple barrel configurations. Heavy-duty Industrial quality construction to support finishing applications such as ball burnishing and part on part, "Electronic" variable speed and digital cycle timer are a part of the standard package. 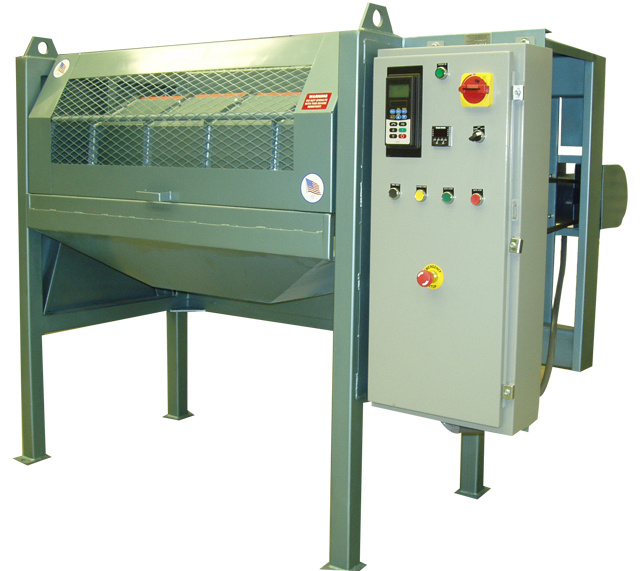 A safety interlock barrel guard prevents the automatic operation of the barrel with the guard open. OPTIONAL EQUIPMENT: A variety of barrel linings including "No-Seam" vinyl, Urethane, or Neoprene. Also available on HT-series are end of cycle audible horn or flashing light, digital tachometer, Roto-Rinse system for right, left or both barrels, drain doors for all size barrels and Heavy-Duty drives for Extra-Heavy applications.